At the beginning of each new school year, I try to do a lesson that helps the class get a vision how their seminary class can be powerful this year. Here is the general lesson plan for that lesson and click on the picture here to download the Chinese character, "The One Rule" and other graphics that go with this lesson. Then next to those items on the board we dive into the scriptures where the Lord has outline how he wants each one of those to go. -SONG -D&C 25:12 -Look for how we should sing in seminary. o What is the difference between a “song” and a “song of the heart”? o What is the blessing we will get upon our heads? -PRAYER –D&C 42:14 -Look for the role of the Spirit. o What is the difference between a “prayer” and a “prayer of faith”? (Actions back up what you are praying for”) How can our actions back up those specific things on the list? o What do we have to have to teach? o What if it isn't there? o What does this mean the one rule in seminary should be? (See handout). o Then I show how everything can be answered by this one rule. THOUGHT & LESSON–D&C 88:122124 -Look for things we should do as a class. o What are some things we should be doing? How? 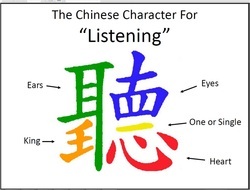 o When “Listening” comes up, show the Chinese graphic (See handout) and show how the wise Chinese put many elements into this one word. Point out each element individually and ask why that element was included. It hopefully will teach how to listen to each other effectively, one at a time, and edify each other. o Go through verses 123-124 also and have them look for how those things would bless the seminary class. With this I like to share the graphic how “Seminary is a Safe Place” and how we should not feel threatened to share our thoughts with the rest of the class. I also like to share Matthew 18:20 and ask, “What does it mean to ‘gather in his name’? Then I challenge them to live the principles we learned to make this an incredible seminary class this year. The last page is a cell phone policy that many have adopted. Use if you like. Keeping track of absences, tardies, and personal scripture study (as the Brethren have asked us to do) can be very challenging. Teachers have found that this weekly attendance sheet can do the trick of all of those things quite easily. The best way I have seen this used is that the teacher will have this form by the door where all of the students come in. Then the students just write down what time they got there (have a clock near the sign in place). I like this better than having a secretary or the teacher mark it because it helps the kids realize what time they are actually getting there. In the students mind, they might be thinking “I’m not too terribly late” but when they are marking down 6:11 (when seminary started at 6:00 am) then they will realize better how late they really are. I have found kids are surprisingly honest with this. And for the few who are not, it is so easy to catch and call them on it. It also makes things easier on you. You just have to put out the paper each morning. Notice that in the grey area, they mark if they read the scriptures and there is a place to also put it if they read on the weekend. It is nice at the end of the week to have them add up how many minutes late they were. I am sending this as a Word document (instead of a PDF) so can insert your kids names once, save it, and then just print a copy each week. At the end of the week, you can just take that paper and enter the attendance in WISE. Let me explain what that is. At the beginning of class when the devotional is assigned and put together (Song, Opening prayer, Scriptural Thought…) I want also someone to be assigned “The Spot”. That student knows that at the end of class, they will be put on “the Spot” and will need to share what was the big lesson they learned that day in class. So in other words, after you challenge your class and testify and close the lesson, then you say, “Billy, it looks like you were on the spot today. What was the big lesson you learned from class today?” And then Billy would share what he learned. There is room for variety with this. One teacher had a big yellow mouse pad that she slaps on a student’s desk to let them know they will be on the spot today. One teacher had a little stuffed dog called, "Spot" she would toss to a student for "The Spot" and then that student would toss to another. You could also call this, "The Takeaway", or "The A-ha". Anything could work. “The spot” is also good because it shows you as the teacher if the big points came through. I've found this also makes the other kids want to chime in. It also helps review what they learned and keeps them on their toes. I am also attaching a devotional chart so it will make it easier for your class president to know what to write on the board. Some of you teachers already use something like this, but here is something for the rest of you. Naturally it is nice to have written up on the board what the opening hymn will be, and prayers, etc… But it is a pain to have to write all that up every day and then it cuts into your precious board space. Here is a solution. Have it on a paper (that is laminated with magnets on the back) that you can put up and take down easily. This also gives your class president an outline of what he needs to put up on the board before starting class. Before I laminated it, I also added a piece of red or blue paper behind it to make it stand out a bit. 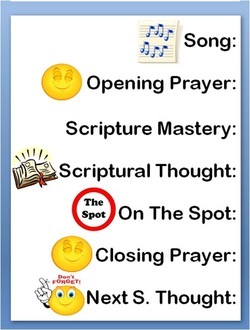 Naturally, you can do "The Spot" without using this devotional chart. Click on the first graphic to download the PowerPoint file. I put it in PowerPoint so you can adjust it to your own needs. The summer time is a great time to plan how you want class to be. Class Presidencies are a great way to help students learn to be leaders, and help relieve a huge burden on you at the same time. What should class presidencies do, you ask? 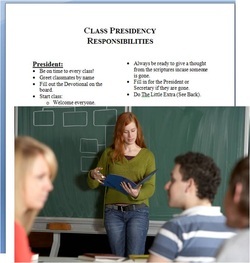 Click on the picture to download a great handout for your potential class presidency. This handout spells out what responsibilities you might want to give the. When I appoint a new class presidency, I sit down with them and read over both these pages to help give them a vision of what wonderful things they can do as they magnify this responsibility. Here is some help with Scriptural Thoughts and a lesson idea all rolled together. The handout here is something I put on the class bulletin board to be referred to later. On the last page of the handout is also bookmarks for the class. 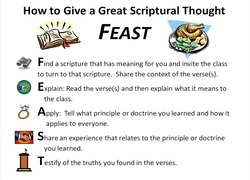 I also made copies for the class and explained that the acronym FEAST explains how I want scriptural thoughts to be given in class. (This is also similar to how missionaries are trained to share scriptural thoughts with others so it is great Pre-MTC training!) 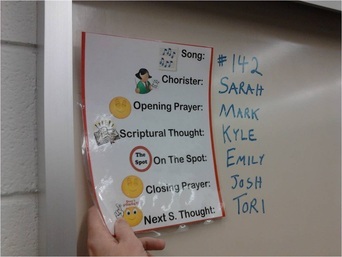 I have my class Vice President keep track of who has the scriptural thought for the next day and to remind them. Usually at the beginning of a month, I have the class sign up on a simple calendar what day they will be giving their thought. For what scripture to share, I tell them that nothing warms my heart more than to hear them start their thought saying, “I found this scripture last night when I was reading my scriptures…” Those are the best scriptures and show that they are studying their scriptures in a meaningful way. After I go through FEAST, I invite them to now practice what they learned. I give them a juicy scripture block and divide it into 3 parts. Then break the class into thirds and have them read their page(s) looking for a scriptural thought to share just like they would at home. After they read and prepare, the rest of the lesson is them coming up (calling them up randomly using popsicle sticks or something) and sharing scriptural thoughts that they found in the verses. I love having the students standing up there and I sit with the other students. I've been doing Spotlights from my first years of teaching and they have been great to build class unity, participation, and fun. There are many ways to do Spotlights but here is how it has worked best for me. 1. During the first week of school I pass out one to each student to fill out. Make sure you tell them not to discuss what they are writing with friends because it makes guessing too easy later. When they are filled out, I collect them in a folder. 2. Then each Friday I have the student who was spotlighted the previous week come up to spot light the next person. I semi-randomly, pull out a spotlight and then the student spotlighted previously will start to read clues. The first time, just ask any student to do it. I like to have students spotlight others, rather than myself, because it promotes getting the teacher out of the limelight, and putting the students there. 3. At any time, when clues are being given, a student can raise their hand and guess. If they guess correctly, I give them a small candy. If they guess wrong, they are OUT and cannot try to guess again. This keeps students from screaming out every name in the class. 4. Once the person is correctly guessed, then have the student share everything on the spotlight paper and ask follow up questions as desired. 5. Make sure you also put in your own spotlight paper. That will really throw them a curve ball. They will beg to do more than one spotlight, but I hold them to only one every Friday. 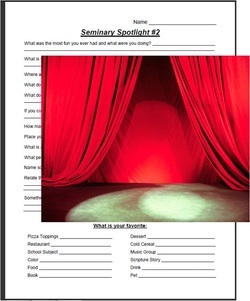 Click on the picture to download the spotlight paper for the first semester. I am also attaching the form for the other spotlight paper below. Just click on the image.